Sarasota city commissioners had numerous questions during a special meeting on Feb. 22 as they heard an interim report from Sarasota Bayfront 20:20, a coalition of arts and civic groups tasked with transforming 42 acres of city-owned bayfront land. Perhaps the biggest one was targeted at estimates for renovating the Van Wezel Performing Arts Hall or replacing it with a new structure. The range was $150 million to $520 million. Bayfront 20:20’s mission is to work with the Van Wezel Performing Arts Hall, Sarasota Orchestra and other groups —such as Art Center Sarasota and the Sarasota Garden Club — to create a re-envisioned, modern cultural district on Sarasota Bay. Its efforts have been fueled by what participants in the process call an unprecedented vision in terms of scope and scale, and a historic spirit of collaboration thus far. In some ways, for arts leaders, the undertaking is reminiscent of the 1964 push to gain support for a public bond referendum to build the Van Wezel. “Where we would be today without those civic and business leaders in 1964?” asked Michael Klauber, Bayfront 20:20’s volunteer chairman, referring to the initial lobbying for a public performing arts venue on the bayfront. Although commissioners peppered Klauber and consultants with questions on Monday evening, several members of the board voiced support for Bayfront 20:20’s concept for a planning commission to tackle the next steps, and they noted how a new cultural district could become a significant community asset. Commissioner Liz Alpert also offered support for the formation of an independent planning group whose work would be funded by $1 million from the private sector. It would oversee the master plan for the bayfront. Advocates also point out that greenspace will be part of the concept for the cultural district, with a focus on increasing the public’s access to the bayfront. Once established, the planning organization will be able to consider proposals that will best meet the community’s needs. It is unclear at this point what scale of facility might be required to serve the Sarasota Orchestra as well as other arts groups, or whether multiple venues might be the best approach. What is becoming clear is just how ambitious the plan is to remake the bayfront. “I would be hard-pressed to think of a community that began a project of this scope and scale, having the collaboration of the breadth and depth that Bayfront 20:20 already has,” Candace Damon of HR&A, a New York consulting firm, told the commissioners. Funding will be a key aspect of the next phases of planning. Damon noted that more and more American communities are relying on private partnerships instead of using public financing to cover the majority of the expenses of new cultural venues. “You have to turn to friends in Canada or London for examples,” Damon said of facilities constructed primarily with public funds. 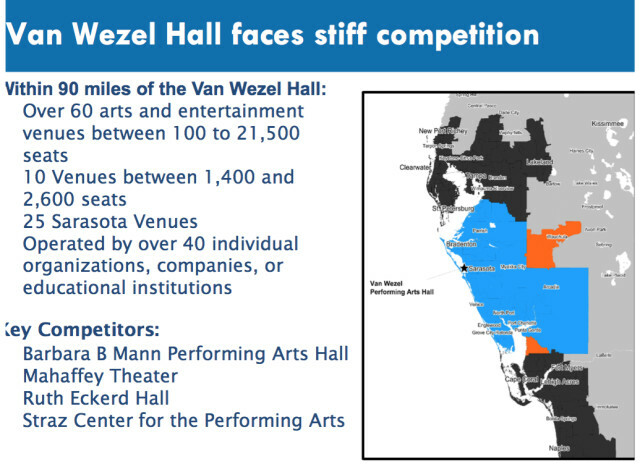 In focusing on projected costs, Commissioner Susan Chapman asked how AMS Planning & Research, the firm with offices in Connecticut and Seattle that was commissioned to conduct the study regarding the Van Wezel, came up with its range. “It is a great question,” said Steve Wolff, a consultant with AMS. “As you know, we looked at multiple scenarios of multiple combinations of buildings.” The estimates are based on what other communities have undertaken, he added. 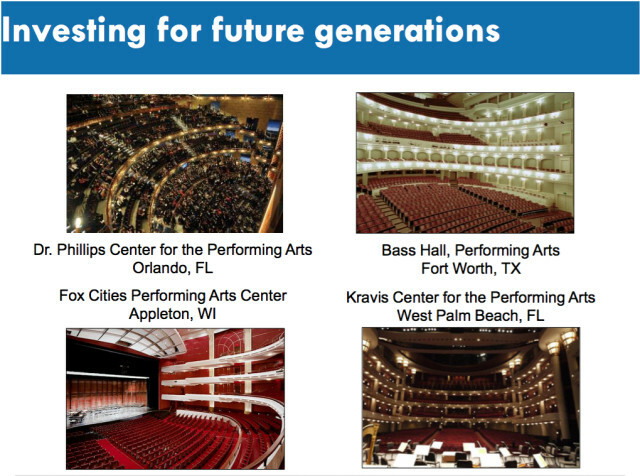 Among those examples are the Fox Cities Performing Arts Center in Appleton, WI (a “Broadway touring roadhouse”), at a cost of about $80 million; the Bass Hall in Fort Worth, Texas, $150 million; the Kravis Center in West Palm Beach, $225 million; and a new cultural center in Orlando that cost $275 million for just the first phase and more than $475 million for the completed project, including ancillary development on adjacent property, Wolff responded. Then Chapman posed her question about whether the city could afford the expense. Examples of successful public-private partnerships abound in Florida, Wolff told her. Chapman pointed out that even in Kansas City, the Kauffman Foundation struggled to operate an iconic cultural asset. Is Sarasota taking on more than it can afford, she persisted. Perhaps a more reasonable model for Sarasota, Chapman suggested, would be the Fox Cities Performing Arts Hall, because Appleton, WI, is a city of 75,000. Wolff replied that the $45 million expense for that venue came in 2002. “So, escalated to current values, the [cost] is $100 million,” he added. Altogether, Chapman had two pages with questions as she probed for more specific details. However, she did not ask all those questions Monday evening, saying she did not need every answer at that point. She did provide the city clerk a copy of the questions to distribute to the other commissioners and staff, and she had sets for Klauber and Jon Thaxton, senior vice president for community investment at the Gulf Coast Community Foundation in Venice. Thaxton has been an advisor to the Bayfront 20:20 group as it has held discussions about establishing a planning commission. Chapman did inquire whether the city commissioners will be asked to tap into the city’s bonding capacity and whether the Van Wezel will be demolished — the latter being a question that many residents have posed. Thaxton said the Van Wezel will be re-purposed, or it will be used in another capacity, if a new facility is built. “To be very clear, we are not advocating tearing down that building,” Thaxton told the commissioners. 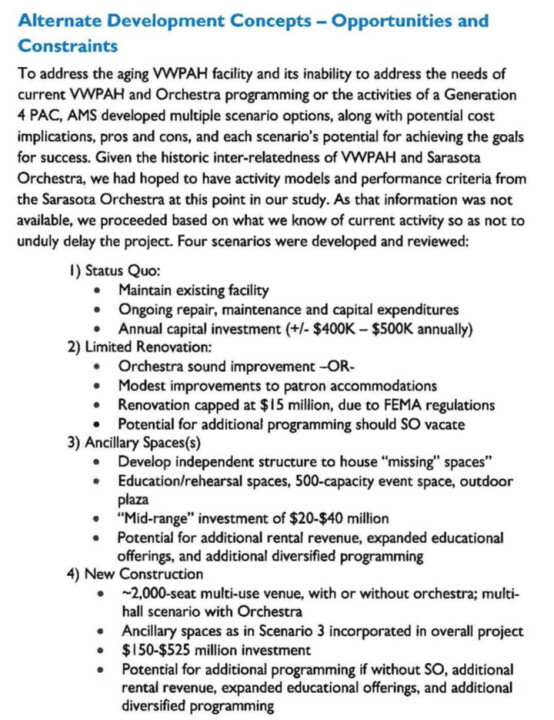 Chapman requested copies of the full studies completed on the needs of the Van Wezel and Sarasota Orchestra, because they were not made available to the board members in preparation for the meeting. Other commissioners had questions, as well, though not as numerous as Chapman’s. Mayor Willie Shaw, for example, asked what would happen to the Sarasota Garden Club and the Sarasota Lawn Bowling Club, which also use city-owned land near the bayfront. Thaxton replied that all tenants will be accommodated in the final proposal. Designed to be composed of special planners, the new nonprofit planning organization will hone the ideas derived during the Bayfront 20:20 work as it creates a site plan over the next two years, Klauber said. “Nothing is more critical than this planning commission,” added Anne Folsom Smith, chair of the Sarasota Orchestra board. The independent group will have a small staff and should adhere to the state’s open meetings regulations, Damon told the city commissioners. “No matter what the law says, [the planning commission] has to voluntarily adopt the Sunshine Laws, and it has to engage with outreach with the public,” Damon said. 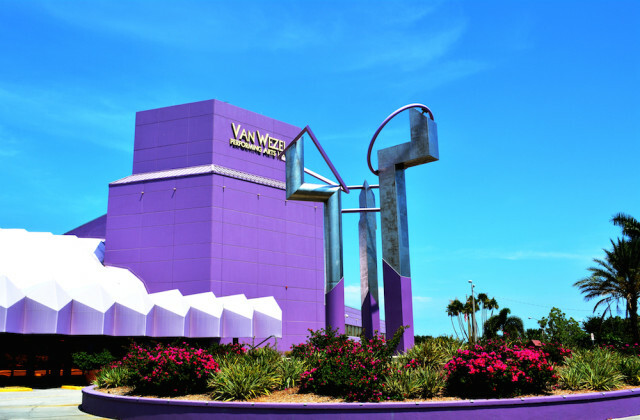 Once established, the organization will be able to consider proposals to build new performing arts facilities to replace the Van Wezel and serve Sarasota Orchestra. 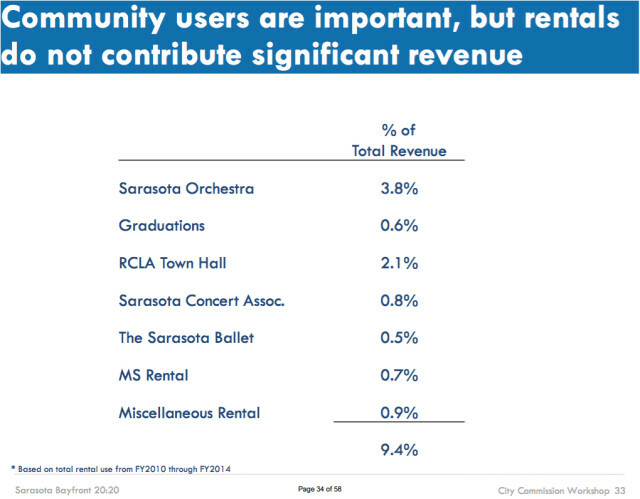 Representatives of the Van Wezel and Sarasota Orchestra told the commissioners that new venues are paramount to their long-term success. 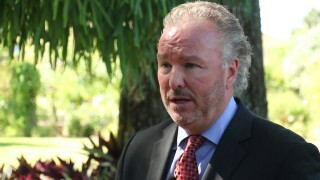 Joe McKenna, president and CEO of the Sarasota Orchestra, said acoustic and schedule-capacity shortcomings at the Van Wezel will be overcome only by creating an additional facility. Building an entirely new structure is virtually the only way around limitations to renovating and expanding the Van Wezel, Wolff said. The planning commission will put the bayfront redevelopment on a fast track, Klauber added. “In order to keep the process moving, I set an ambitious challenge of shovels in the ground by December of 2017,” he said.